Fixed - When trying to run the Project Explorer or DMD Designer you will get an error 'Property is read only : floating'. Fixed - Form menu's OnInitMenu() event is firing when user clicks on system menu button in form's title bar. Fixed handling of negative zero values when comparing them with other values. Modified "=" and "==" operators for double and high precision values so they ignore the sign of a value when the value is zero. Project Explorer now includes the ability to set up INNO Installer upper right icon and left side image. Fixed - with View set to 'small icons' selecting a file is tricky in some cases. It appears that the choose area is not quite right in the navigator.
? "o is an array"
? "m is an object!"
? "m is NOT an object!" Fixed - handling of negative zero values when comparing them with other values. Modified "=" and "==" operators for double and high precision values so they ignore the sign of a value when the value is zero. New look and feel with toolbar and palette icons. New INNO Skins tab. Added functionality for installer skins through INNO. RichEdit is a single or multi-line editor that can be used to create or edit data in the Microsoft Rich Text Format (RTF) or plain text. Used for adding a memo field that is formatted to RTF to a report. A new control for displaying and entering a date, a time, or a datetime value. DateTimePicker has a dropdown calendar control that can be used to select a date. It can be datalinked to a field object or variable that is of type: date, time, or datetime. allowHeaderRowSizing - When set to False, allowHeaderRowSizing prevents the grid's headingHeight from being changed interactively using the mouse. However, headingHeight can still be changed by assigning a new value to it. headingType - new GRIDCOLUMN property to set the heading type for this column. Also, The GRIDCOLUMN class has a new editorType property setting of 6=Pushbutton. This new GRIDCOLUMNEDITOR object has it's own properties derived from the pushbutton class. marginLeft - margin between left edge of cell and left edge of button in pixels. marginTop - margin between top edge of cell and top edge of button in pixels. marginRight - margin between right edge of cell and right edge of button in pixels. marginBottom - margin between bottom edge of cell and bottom edge of button in pixels. 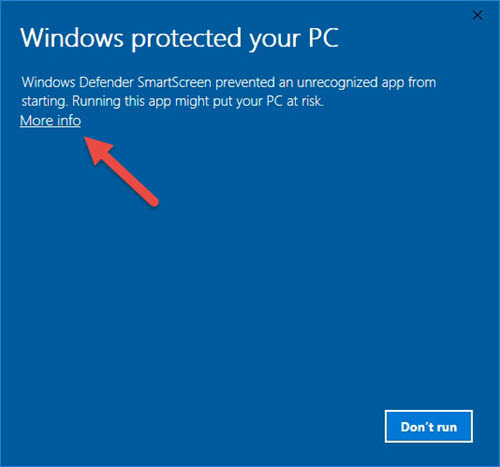 Applications that are signed with a standard code signing certificates need to have a positive reputation in order to pass the Windows Defender filter. Microsoft establishes the reputation of a new executable based upon the number of installations world wide of the same application. So, an initial release of the installer .exe may produce this message. If you get this message..
Click where it says ‘More Info’ (red arrow) … this is a link to open the option to run the installer. Click ‘Run anyway’ (red arrow) to continue. Is Windows XP supported in dBASE™ PLUS 12? NO, dBASE™ PLUS 12 is not designed to work on XP. Since Microsoft dropped support for the OS back in April 2016 we have followed suit. While there are still many users of XP, we are seeing a dramatic drop in the number of people using it. It is never easy to drop support for a OS, especially one as popular as XP. However the resources needed to retrofit, recompile, retrofit, etc. makes it unfeasible to continue support more so when you know that if you hit a snag with the older compiler for instance, you can't go to Microsoft for a fix. So that puts us in an untenable position for a platform that is being rapidly phased out by organizations and individuals every day. That is why we made the difficult decision to drop support for Windows XP and Windows Server 2003 (server version of XP). Are dBASE™ PLUS 11.X projects forwardly compatible with dBASE™ PLUS 12? YES, projects developed in dBASE™ PLUS FULL 11.X should compile with little to no changes. dBASE™ PLUS 12 does not support full backward compatibility. All code from previous versions should be re-compiled. You should still have the idapi.cfg in c:\program files\ ….common files\borland\bde after installing dBASE™ PLUS 12. The installer will create a new idapi.cfg in c:\programdata\common files\borland\bde but you should still have the one in c:\Program files\common files\borland\bde And should be able to copy that over to c:\programdata\common files\borland\bde and use it. Also, the data objects on a form have been modified to require that the parent be explicitly set in a form or a report or other CLASS. sql = "select * from FISH.DBF"
There are a couple of ways to use Parameters with ADOQuery in 8.0.0.3. Most DBMS connections will be able to use positional parameter markers indicated by a question mark (?). Example 1 - in Form.onOpen event. sql = "SELECT * FROM KathyTest.dbo.Companies where NAME = ? " Example 2 - in constructor code. sql = "SELECT * FROM Test.dbo.Companies where NAME = ? " Example 3 - using ADOQuery.beforeConnect event. You can use the named parameters in most circumstances as well. This Example also sets up a Parent/Child relationship on SQL Server data using ADOQueries and named parameters and the masterSource property. sql = "SELECT * FROM orders"
sql = "SELECT * FROM orderdetails where orderNumber=:orderNumber"
If your DBMS ADO/ODBC driver has the ability to set the cursorLocation to 'Server' you may be able to make your ADOQuery.rowset editable and not just readable. For example the following connects to SQL Server and will make the Companies table editable in an ADOQuery object. sql = "SELECT * FROM Test.dbo.Companies"
If you are unable to use cursorLocation = 1 //Server -- then you can use ADOTable objects (which connect directly to table - NOT using sql) to edit your data on a form. You will know if the cursorLocation is settable or not by simply trying it. If it does not hold after setting the object active=true, then it is not available. 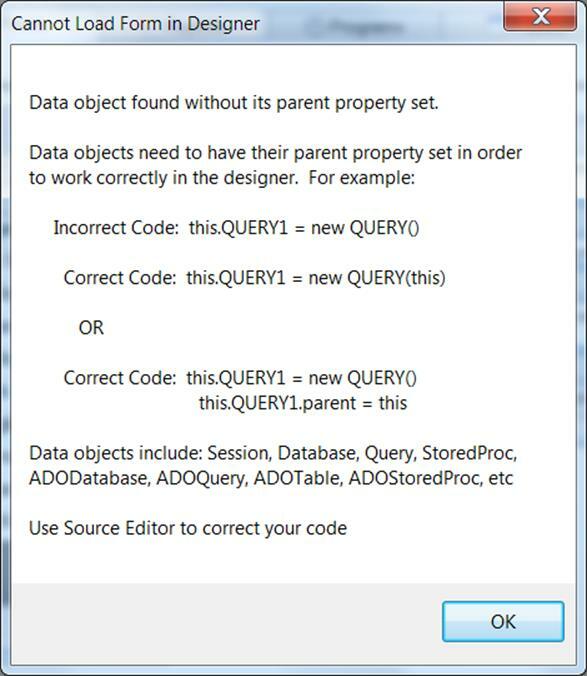 This Example sets up a Parent/Child relationship on SQL Server data using ADOQueries and named parameters and the masterSource property. How do I execute sql commands in ADODatabase object. You would use the syntax for the particular DBMS and Driver you are connecting to. You can usually find the proper syntax by doing a Google search or looking up the driver info. Here is an example of using the executeSQL command on an ADODatabase object with a MySQL connection using the 5.x MySQL driver.
? "about to : CREATE TABLE aLongVarChar (ALongText LongText);"
Language Support: Japanese Language Runtime Files are not available. Workaround: None, we will be releasing it soon. Found that having the MDI Tabs displaying is the main cause of this issue. Workaround: If you select View | MDI Tabs, and Uncheck options "Show" this issue will largely disappear. If you have a rectangle and are setting it’s transparent property to True. You may see objects looking as though they disappear inside of the Rectangle your form. Workaround There is a simple fix. By setting the Forms doubleBuffered property to ‘True’ this should fix the rendering of the rectangle and the text or other objects inside of it. ADO Support: Issue #391 - ADO with date field in MySQL Causing rowcount of -1. This will allow the count() to process correctly as well as view data programmaticaly. However , viewing the data in a grid or form component is not correct for the Date field that has a 0000-00-00 actual value. This issue is occurring due to an error being encountered when our ADOField object attempts to retrieve the value for field aDate and aDate contains a zero date. The previous value (from record 2) is being left in the field buffer. ADO use with Apache: Issue #1017 - get MAV instantiating an ado object in a web app. Workaround: This issue will occur on any 64 bit version of windows beginning with Vista. The problem is due to the fact that Windows uses the environment variable 'CommonProgramFiles(x86)' to find the ADO DLL's at runtime but Apache does not allow parenthesis in the names of any environment variables that it passes or creates for web apps that it executes. It converts the parenthesis into underscores, for example: CommonProgramFiles_x86_. The simplest solution for this is to have each web app that requires ADO access to create its own environment variable before it attempts to create any ADO objects. Adding the following code near the beginning of these web apps will create the needed environment variable. extern CLOGICAL SetEnvironmentVariable(CSTRING, CSTRING) kernel32 from "SetEnvironmentVariableA"
cEnvStr = "C:\Program Files (x86)\Common Files"
This instructs Apache to pass the existing environment variable (CommonProgramFiles(x86) to any web apps as part of their default environment. but it will have the needed path assigned to it which initEnv() will use. Also when connecting to an ADO database it is best to use the .connectionString property when connecting to an external database in a web app. sql = "SELECT * FROM "
Code Completion: dComplete issue - varaibles are currently not checked for scope. x. //Will show list of Array members instead of list of the query. Code Completion: Parent reference does not produce a member list ..
in a simple form with a grid (or some other object) ... in an event do .. this.parent to reference the form. For example any objects defined in a file that is included with an #include or SET PROCEDURE to or in a Super classed file. q.sql = "select * from Fish"
at this point there is no member list. Miscellaneous: Transform without 9s in numeric mask adds extra space. Miscellaneous: Adding a new event function can put the cursor in the wrong position. In a form or a report ... open it in the designer .. click an event wrench in the inspector to start a new function for that event. the Source Editor will open but, the cursor may not be placed directly in the new function. You can create individual User Database Aliases in dBASE™ PLUS 12 when using the user’s UAC Paths in Vista or Windows 7. In the User’s PLUS.ini (or the applications .ini) file. USERBDEALIASES Is a setting which allows a standard user to create a User Alias that gets saved to the user's ini file. A standard user will NOT be able to add a regular BDE Alias that gets stored in the BDE config file (idapi.cfg), unless the user is given administrator privileges OR is put in a custom user group that has full access to the BDE's registry keys and the folder containing IDAPI.cfg. - an .ini file containing User BDE Alias settings that the runtime will auto load when starting your application. - a custom routine that your program runs to create on-the-fly any User BDE Aliases needed while your program is running. Does dBASE™ PLUS 12 support Unicode? However, the .dbf and .db tables currently do not support these sets of characters. We are working on changing this for a future release. Please keep an eye on our website as we will be making many changes in the near future. With ADO connections however, you can connect to external databases that use Unicode and other data types. Since ADO connections are outside of the BDE, it is not restricted by the limitations of the BDE. You can find more detailed information from the help for ‘ADO’ under the ADO book in our online Help system.